Bells were rang to memorialize the timing of events that occurred on Sept. 11 by family members, veterans, and first responders. Seventeen years ago, John Rodak’s, Nicholas Brandemarti’s and Perry Thompson’s lives were lost during the Sept. 11 attacks in New York City, and others at the Pentagon and Shanksville, Pa. The day is now known as Patriot Day across the country, and it calls on everyone, present and future, to reflect on the U.S.’s strength and the memories left behind by those who perished. The ceremonial metal bell, which was donated and constructed by Mantua Township resident Troy Bartlett and is only used on Patriot Day, was rung first by wife Joyce Rodak; daughters Chelsea and Devon; and Chelsea’s husband Vincent in remembrance of John, who died when American Airlines Flight 11 struck the North Tower of the World Trade Center at 8:46 a.m. between floors 93 and 99. 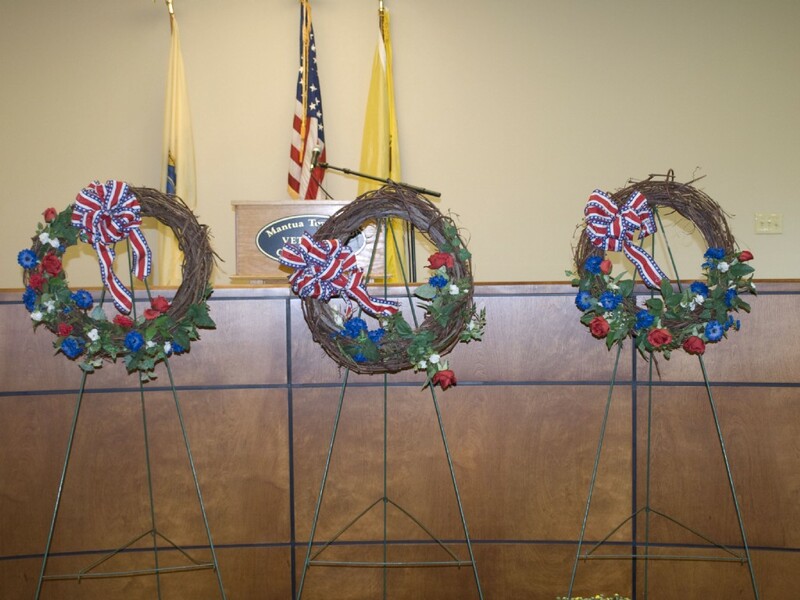 Harrison Township Mayor Lou Manzo personally knew the Rodak family and has seen them grow up since they started attending the county’s annual ceremony. Brandemarti’s family members rang the second bell in memory of him at 9:03 a.m. when United Airlines Flight 175 struck the South Tower of the World Trade Center at 9:03 a.m. Fifty-five minutes and 51 seconds later, the tower collapses. The Mantua Township Police Department, Gloucester County Emergency Medical Technician (EMT) and Mantua Township Fire District No. One all rang the third bell at 9:37 a.m., which signified the time that American Airlines Flight 77 crashed into the Pentagon and started a violent fire. At 10:03 a.m., the fourth and final bell was rung by New Jersey Veterans of Foreign Wars Commander Duane Sarmiento for United Airlines Flight 93, which crashed in Shanksville, Pa., when passengers and crew tried regain control from hijackers. 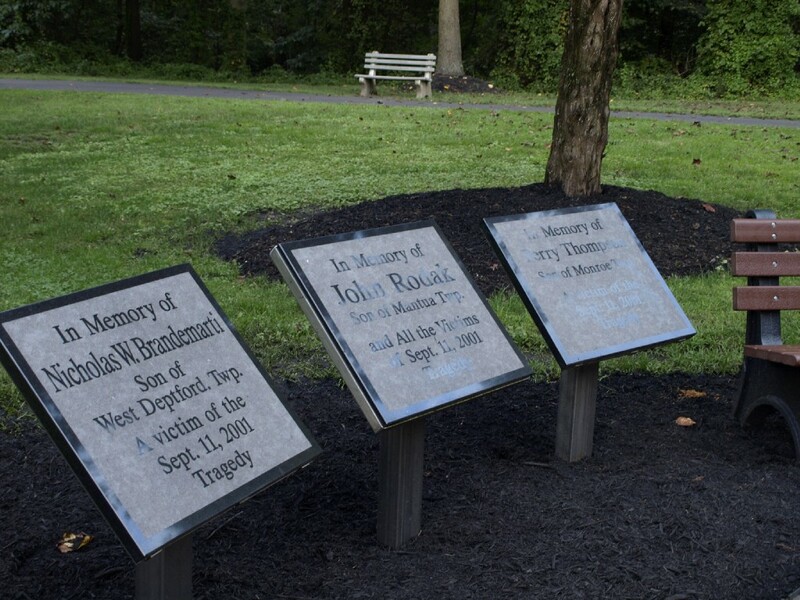 In Chestnut Branch Park’s 9/11 Memorial Place of Reflection are several artifacts from the day’s events, such as a twisted I-beam recovered from the World Trade Center, plaques for Rodak, Brandemarti and Thomson and a flagpole donated by the Rodak and Brandemarti families. Six flagpoles representing each branch of service and the American flag, a block of limestone from the Pentagon and an open space for those who sacrificed their lives in Shanksville complete the park’s memorial. 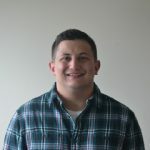 Devon Rodak makes it a priority in her life to teach those who were not born yet or do not have memories of the attacks what it meant to her, how to get through the grieving process and what America, today, can learn from it. White reminds people that 9/11 was an event that changed everyone’s lives in an instant and it brought Americans together during a time of tragedy.